Reportedly 290 million people around the world suffer from blindness, more than half of that number from visual impairment in the form of age-related macular degeneration or glaucoma. These individuals either depend on handheld magnifying glasses or ineffective apps or just end up enduring the strain. Isn’t this reason enough for us, the millennials, the tech-savvy generation to give them hope, an improved quality of life by assisting them with a sense of sight? Headed by Amnon Shashua, Shai Shalev-Shwartz and Yonatan Wexler, professors and engineers from the University of Jerusalem, created a system based on algorithms called OrCam which is essentially a tiny camera and bone-conduction speaker wired to a portable computer (not to worry, pocket-friendly) and possessing “human” qualities like the ability to recognize objects and read written English words out aloud, when prompted. The instrument conveniently sits on the side of the wearer’s spectacles, even on sunglasses, with the help of a magnet. 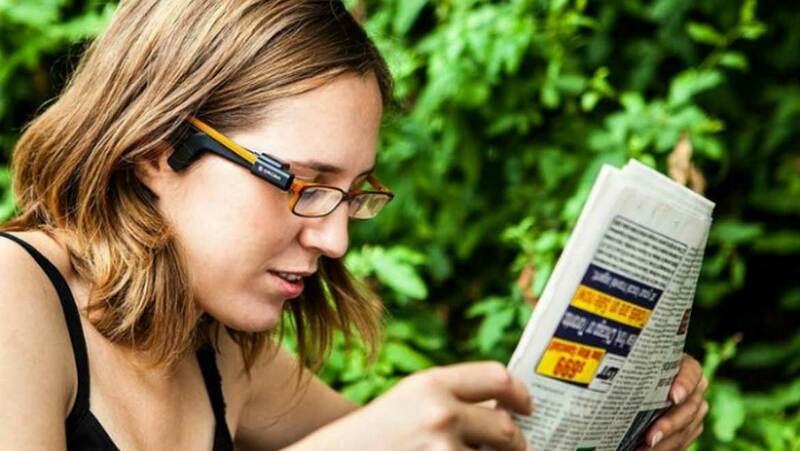 Unlike many other technologies like Google Glass or Argus II developed for similar purposes, OrCam was designed not only for the blind but also for those with reading disabilities, limited vision or the visually impaired. What an empowering application of artificial intelligence! On pointing or touching, the system can speak the content from a wide range of sources — newspapers, books, traffic signals, directions, credit cards, ingredients from a box and so on, and interestingly, it can also identify the faces of family and friends. Wait, how? Apart from what is already stored in the inbuilt memory, the user can add new items and people by shaking the device and waving in a certain direction, respectively. Note, all this done in realtime! A study was conducted at UC Davis Eye Center to test the true capacity of OrCam on 62-year olds. With their poor eyesight kept constant, participants who were, on an average, able to complete 5 out of 10 tasks (such as reading messages or signs) were, with the use of this device, able to successfully perform 9 out 10 of the same tasks after a week of application. Some customers of this product described the experience as, ‘such a great part of my life, socially, ‘shocked at technology’, ‘it’s like having a friend read to you’, etc. OrCam is advantageous in that it is discreet, has minimal controls, provides a better everyday lifestyle to patients who are diagnosed with incurable conditions, comfortable and harmless, ensures a chance to be included in conversations and the right to adequate information. The benefits seem limitless, character recognition in low natural light and increasing processing speed being the only challenges the makers foresee in the near future. Although costing $2500 currently, the joy it promises to give for a lifetime is priceless! It is revelation that a blessing like OrCam can be accessed by fortunate souls that deserve a bit of serendipity. Now, taking vision for granted is no longer an option!